There is nothing quite like the crisp, new-start feel that comes around every autumn. Kids are back to school and you’re finally able to walk outside without excessive sweating! Plus, the changing colors on the leaves are magnificent. 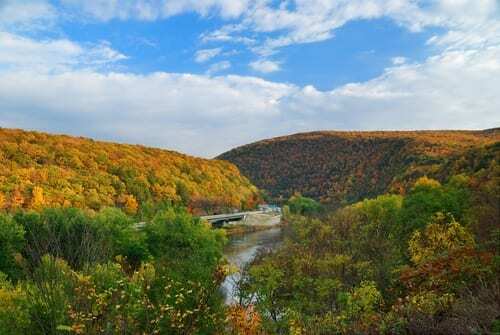 Check out our list of the best places to take advantage of the the magnificent fall foliage. 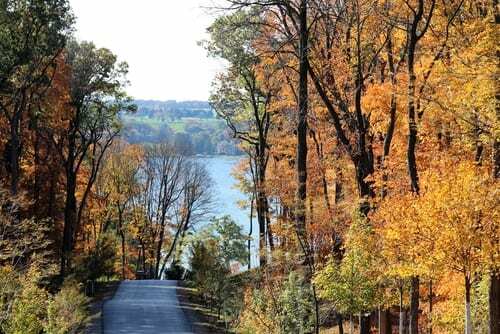 Venture to Route 507 around Lake Wallenpaupack for a stunning autumn road trip. Leaves begin to turn in mid-September and peak in October. As the originator of Arbor Day, Nebraska City has some of the most stunning autumn trees in the midwest. There are several other places near Omaha to check out the fall foliage, including Ponca State Park, Platte River State Park, and Mahoney State Park. Starting in Leavenworth, Kansas at the intersection of K-7 and K-92 and extending 63 miles through the Glacial Hills of Kansas to White Cloud, Kansas is the road known as “Glacial Hills Scenic Byway”. In the fall, the hills and valleys are filled with gold-toned hues ranging from yellow to orange to a gorgeous burning red. The charming seaside village of Bar Harbor on Mount Desert Island is located near Acadia National Park. This is also home to Cadillac Mountain, which is the first place that the sunrise becomes visible in the United States. Not only is Lake Geneva home to some of the country’s most amazing fall foliage views, it also has some of the longest lasting displays of autumnal beauty. Beginning in September, trees begin showing hints of the fall season. Colors burst and pop all the way through the grand finale of caramel brown in late November. 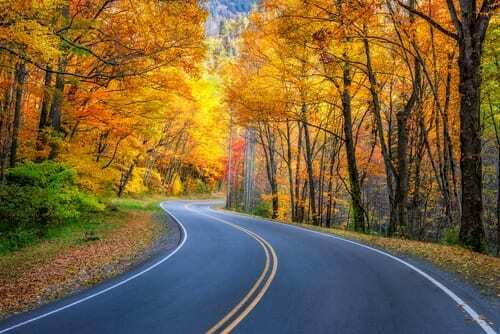 South Dakota is home to many scenic drives for those hoping to witness the beauty of fall foliage. 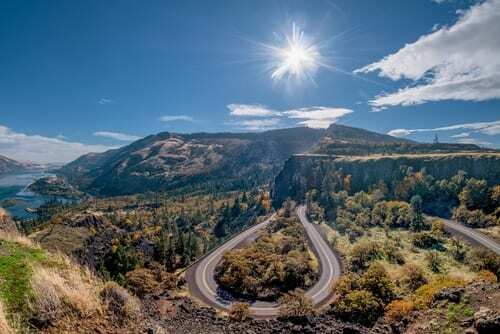 The Peter Norbeck National Scenic Byway leads you through six rock tunnels and granite pinnacles, all dotted with the most stunning autumn colors you could imagine. Stowe is located in a fertile valley in the north-central region of Vermont. 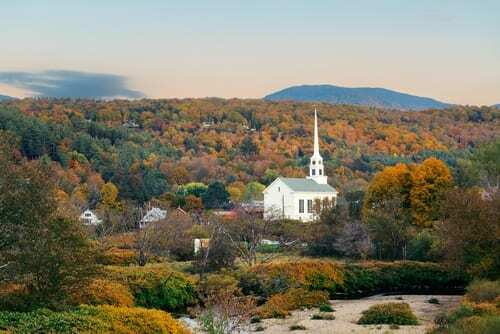 The historic community known for outdoor activities and boutique-y hotels and restaurants is surrounded by Mount Mansfield. The highest peak in Vermont, Mount Mansfield offers views touched with flaming red, orange and yellow foliage. The M-22 Color Tour offers 116 miles of scenic highway that winds through the countryside of a few small Michigan towns. The colors are gorgeous in spring and summer, but exceptionally memorable in the fall, especially along the shores of Lake Michigan. The Columbia River Gorge in Oregon offers some of the most stunning autumnal colors in the United States. The road leading to The Gorge also has many stunning stops to look out for. Don’t miss Latourell Falls, Multnomah Falls, and the largest fish hatchery in Oregon at Bonneville Fish Hatchery. Call us today to find out how we can help you experience one of these memorable fall foliage destinations. You can reach us at 402-281-3022.